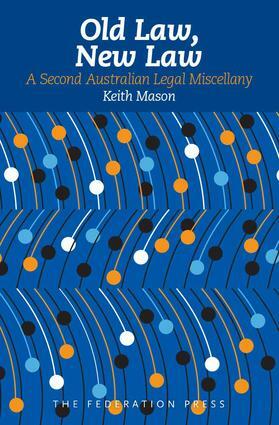 Old Law, New Law follows the author's Lawyers Then and Now in offering a miscellany of genuine legal stories drawn from Australian legal history as well as its modern law. If there is any change of focus, this work looks at the people of the law through the prism of established or changing legal doctrines and processes. Keith Mason has been a solicitor, barrister, law reformer, solicitor-general, president of a court of appeal, law teacher and mediator. He has published on topics including judicial method, legal taxonomy, the law of restitution, and the interface of law, morality and religion. Currently he is a visiting professorial fellow at the University of New South Wales and the chancellor of the Anglican diocese of Armidale. This work, along with Lawyers Then and Now, combines the interests of an amateur legal historian with insights drawn from a fortunate life in the law.